As far as I am concerned, I ‘AM’ my library; I have been building my collection for over 20 years. Crime fiction, art history, literary criticism, history, literature, popular, lexicographical, the list is endless. Luckily space has not been a constraint for me as wherever I have lived I have always had space for my books. Although sometimes I have had to get a bit creative: I have turned spare bedrooms into a library. And the drawing room. And the dining room. And well, sometimes the bathroom. In fact, let’s just say that I am an expert at putting IKEA Billy bookcases together and leave it at that. Of course I dream of the day when I have a beautiful bespoke library and/or cosy reading nook surrounded by books; in fact I have a Pinterest board devoted to book shelving! A couple of years ago I owned over 1100 books. And I was all set to keep going. But then I relocated back from the US (my third international relocation in seven years) and I realised that I just couldn’t justify the expense of shipping (and insuring) over 30 boxes of books – again. Sighing, I managed to convince myself that a small cull was the only way and donated/sold maybe 300 books. It was a wrench but as I had found books much cheaper in the US (than Australia, where I was living before) I had been buying indiscriminately and joyfully for two years, so I targeted those books and the cull wasn’t as heartbreaking as it could have been. Three years on we are moving again, this time to England and the 800 books I had shipped back to Australia from the US have somehow increased in number again. So once more I have to give myself a stern talking to. Do I really ‘NEED’ all these books? Can I really ship/insure them for a fourth time which would mean that I will have spent more on shipping my personal library, than the cost of compiling it?! And let’s be honest, I am not going to reread all 1000-odd. So why do I want to keep them all? Why am I finding this cull so hard? Part of it is book lust – I like looking at them; I receive a huge amount of satisfaction from just standing in front of my wall(s) of books and looking at them, browsing them, dipping into old favourites. Part of it (and this does not reflect well on me) is that I am proud of the number of books I have – ‘Look at me, I’m a big reader’, that’s what my shelves say to anyone visiting my home. And part of it is that I just can’t let go of a book once I have read it. Books are friends, they are companions. One of the reasons I have taken my library with me on all my moves is that they are a constant, a familiar ‘place’ that I can recreate no matter where I live. They are a source of memories (books given as gifts, books signed by authors, books bought when travelling, books bought as a result of recommendations from friends), a source of comfort (there really is nothing like rereading an old favourite, curled up with a cup of tea in a comfy chair). And, obviously, they are a source of entertainment which I needed when I was new in town and hadn’t had the chance to meet people (usually by joining three local book clubs!). But I have to cull. I cannot ship over 1000 books internationally again so I made a rule and it’s a simple one. Any book that I have read and have no intention of rereading I decided I had to discard. But it’s not simple. Because every time I find a book I haven’t reread and that I have no intention of ever rereading, I find a reason to keep it. I like the cover. I like the author. I ‘might’ read it again, who knows? 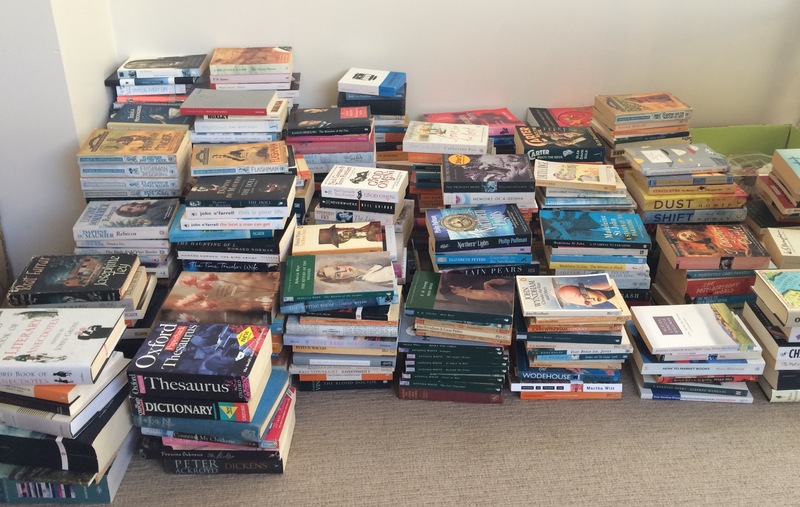 So there I was, a couple of weeks ago, on the floor in my study surrounded by piles and piles of books in the ‘to ship’ area and one lonely pile in the ‘to donate/sell’ area trying to follow my simple rule and I had an epiphany. Maybe I’m ready to make the move without all of my books. Maybe I can just take my favourites and my reference books and ‘let go’ of the rest. After all, I am moving ‘home’, I don’t need my ‘comfort blanket’ this time. And suddenly I was at peace with my book culling. The piles and piles of books transformed themselves from friends into a mixture of friends, colleagues and distant acquaintances, making it much easier to sort them. And so I packed my acquaintances and colleagues into boxes and took them down to the local charity stores, the secondhand bookstores and handed them out to friends with a light heart.